SimSam is a program to simulate samples from finite populations. 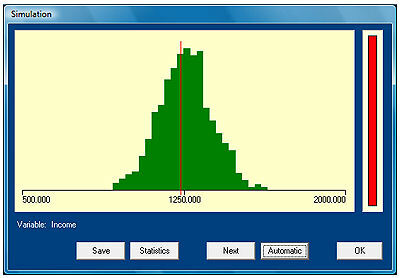 By repeating the selection of the sample a large number of times, and computing an estimate for the population mean for each sample, the distribution of the estimate can be portrayed on the screen. By taking a look at this distribution, it becomes clear how well an estimation procedure is able to estimate the population mean. You can download SimSam by clicking on the link Download SimSambelow. There is no installation procedure. Just copy the file simsam.zip to a map, and extract all files. You start the programma by double-clicking aan the file simsam3.exe. The file simsam.pdf contains a short manual. Blaise is a flexible and powerful system for computer-assisted interviewing. It supports various modes of data collection, such as CAPI, CATI and CAWI. It contains several tools such as Bascula for adjustment weighting. Blaise is used worldwide by national statistical institutes and related scientific research organisations. You can download the demo-version of Blaise by clicking on the link Download Blaise. Each chapter of the book ends with a set of exercises. You can download the answers of these exercises by clicking on the link Download answers.